The idea was that oil production was about to decline (starting around 2000) because the easy-to-develop oil fields had all been discovered and the remaining fields were thought to be too expensive to develop. At the same time, demand for oil was increasing, especially in China, so that the supply-demand curves would intersect some time around, or before, 2016. After that point demand for oil would be unsatisfied because there just wasn’t enough oil to be had. This, I felt, would trigger more teleworking since oil was the primary energy source for transportation. No gas, no commute unless you’re telecommuting. Well, as is the case with most forecasts, reality turned out to be slightly different. Demand for oil dropped after the global economic recession in the late 2000s, even with China’s increased demand. Fracking provided a means for expanding oil fields that were previously thought to be unprofitable at then current oil prices. OPEC countries, particularly Saudi Arabia, decided to keep producing oil anyway. The result was a glut of oil and a drop in prices to below $40 per barrel. The point of that maneuver was to drive out the frackers and get the price of oil back up to the $100 per barrel range. While all this was happening the world finally “discovered” climate change and its portent of a really miserable future. That is, unless we collectively stop (not just reduce) our burning of fossil fuels we’ll be in serious trouble in so many ways. The reality of global warming and climate change has become apparent even to politicians in states of denial. 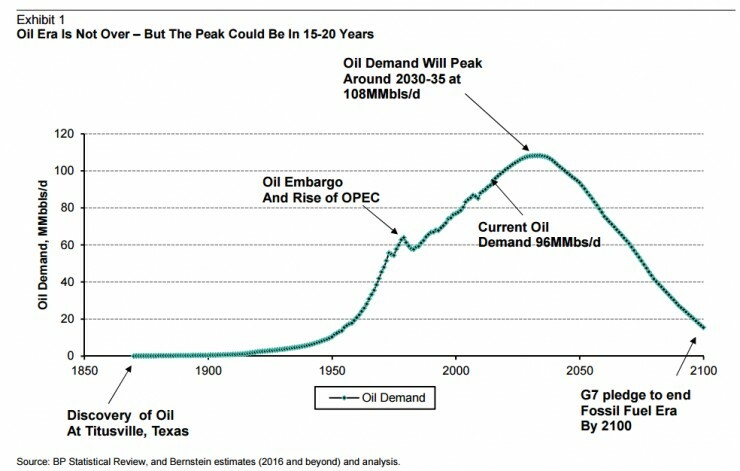 So now we have new estimates of the peak oil demand, as shown here (CREDIT: Bernstein Research). The model has changed from concentrating on the limits to production to the limits to demand. Note that the curve shown post-2016 is an estimate but it reflects the conviction that, according to the G7, we have to end our use of fossil fuels by 2100. 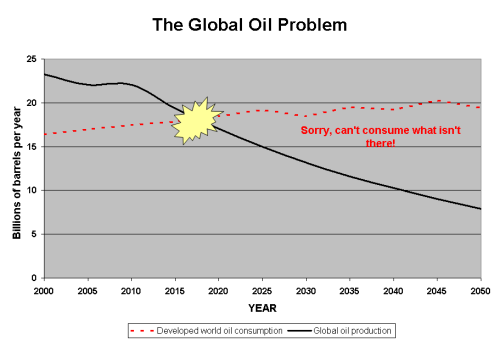 I think the estimate is optimistic; we need to act faster than the curve shows. For related information see these comments by Joe Romm in Think Progress. So what does telework have to do with this parlous situation? Simple, telework reduces oil consumption by moving the work to the workers rather than moving the workers to work. It gets people out of their cars, at least for work-related travel. There are other alternatives for transportation energy reduction, such as electric vehicles (where the source of electricity is renewable), but EVs constitute a tiny component of today’s vehicle fleet. It may be decades before they are in the majority. Telework is now. The current low gas prices in the US have prompted a counterproductive resurgence of gas-guzzling SUV ownership (where the big profit margins are for the auto industry). EVs are still pricey compared to their non-electric competition. Telework is now. The growing adoption of automation by all sorts of businesses is changing employment demands and their associated energy uses. Automation and computers are eliminating some jobs and inventing entirely new ones, mostly computer-related. Not all those new jobs, and three-fifths of the existing ones, are location-dependent — they could be done anywhere. Particularly in settings that use renewable energy sources. Telework is now. We don’t have to wait for some magic new technology to rescue us from climate change. What we need to start the transformation is here right now. The solution has shifted from the supply of oil to its demand. Peak Oil 2.0 is here.